This new and improved heavy-duty “TUNDRA” flagging tape is nationally recognized as the best quality on the market today. It is made from a superior grade of 4-mil non embossed PVC with a low cold crack rating (up to -40?F temperatures) and extra U.V. inhibitors. “TUNDRA” is reasonably priced for those who don´t mind paying a little extra for the best product. 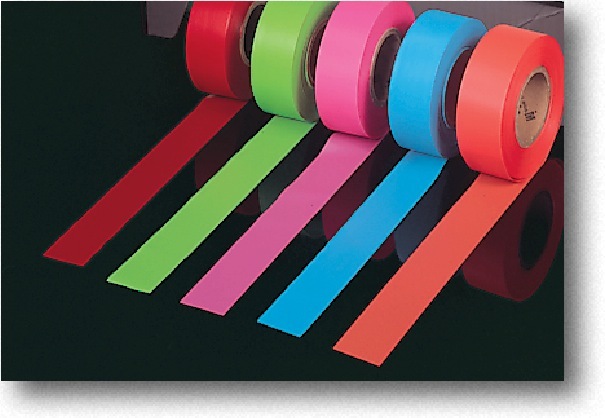 Available in 5 Glo Colors, these tapes are stocked in 1-3/16” widths x 50yd, but are available in widths to 48” (minimum orders apply). When ordering, ask for “TUNDRA” by name. 12 rolls per box, 144 per case.